This page is about the aircraft A6M2-N. For other uses, see A6M (Family). The A6M2-N is a rank II Japanese fighter hydroplane with a battle rating of 2.7 (AB) and 2.3 (RB/SB). It has been in the game since the start of the Open Beta Test prior to Update 1.29. Albeit generally worse than the "normal" Zeroes, the A6M2-N still retains good climb rate, acceleration and maneuverability. It suffers from bad performance at higher altitudes, but that is rarely a problem for this plane, as high altitude engagements are rare at Battle Rating 2.3. It also has good armament for such a low Battle Rating: two x 20 mm Mk1 Type 99 cannons and two x 7.7 mm Type 97 Machine Guns. Although powerful, the guns have low shell velocity, so you should lead your target more than you think. Also, the ammo count is quite low, and the aircraft has no kind of armor or self-sealing fuel tanks, so it is best to avoid taking too many hits, as you will probably start burning from the first 7.5 mm machine gun bullet. The aircraft is designed to land on water, though like all other seaplanes, with enough care, one can land it on airfields. This play style is a common theme among all Japanese Zero's, due to playing aggressive and going for head on attacks is not an option (no armor, wood frame, no self sealing tanks...fires!). In saying that, you want to stick to tactics that are purely defensive and only attack when someone attacks you and not vice-versa. If you do think you can attack, make sure that the enemy is within 1 kilometer of you (2 kilometer's max) once engaged you are in that fight till the end but if the fight goes sore, remember to turn in defensive manners and only maneuver in manners that will keep you safe and leave the chaser in a disadvantage where he has to or is forced into a recovery maneuver to keep with you. But because your a float plane, it's going to be a bit hard trying to turn so speed is everything but luckily due to the weight being below the plane, downward turns are fast and quick but be warned...the neck of the main float has a oil cooler and the float itself has a massive fuel tank, so be extra careful than being in a normal Zero. 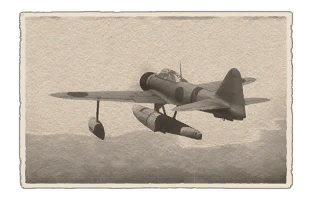 Grinding the A6M2-N will be depending what game modes that you play frequently. If it is realistic battles or simulator battles, it is best to focus on aircraft performance as you will be engaged in frequent maneuvering engagements. In arcade battles, its better to focus on firepower as most of the time you will get into head on attacks against other players. The single-seater, single-engine float seaplane fighter A6M2-N was created to cover combat operations near atolls, where the construction of airfields was often impossible. 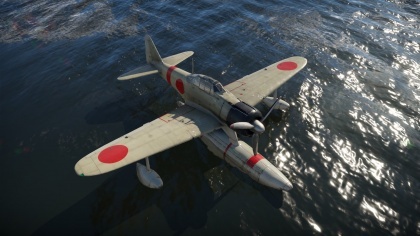 Initially, the Kawanishi N1K1 Kyofu was planned for this purpose, but it soon became clear that Kawanishi was unable to produce the planes in sufficient quantity before the start of the war, so the navy asked Nakajima to create a float seaplane fighter. The A6M2 model 11, with non-folding wings, was chosen as a starting point. The landing gear was removed, and a large float with a built-in fuel tank installed in its place. A float was also installed under each wing for stability. The plane’s armament was left unchanged. Despite the significantly increased aerodynamic resistance and weight, the plane was quite fast and maneuverable. 327 of these aircraft were produced, including the original prototype, but the first A6M2-Ns barely ever took part in combat, since they were destroyed shortly after arriving at Tulagi (in the Solomon Islands) in an attack by U.S. B-17s from the 11th Bombardment Group. They were used primarily as interceptors. Skin and Camouflages for the A6M2-N in Warthunder Live. This page was last edited on 3 April 2019, at 06:41.